You need a speed control to operate a Foredom flexible shaft machine. A speed control allows you to adjust the speed from low to full. Most people use a control that is separate from a motor, but we also have motors with built-in, dial speed controls: M.SRM, M.TXM, and M.LXM. Each motor connects to a speed control and NEVER directly into an electrical outlet. The 6′ long speed control power cord plugs into an outlet. 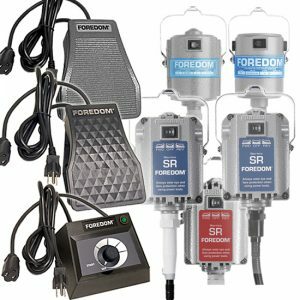 The most popular is the plastic housing foot operated model that features durable, solid state electronic circuitry in an extra wide footprint. 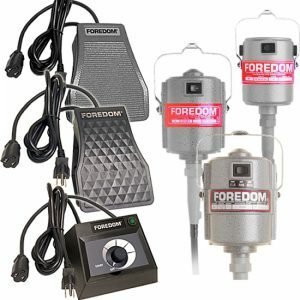 The other foot operated control shares the same electronics but comes in a much heavier, cast iron housing that eliminates any unexpected movement on the floor. The third style is a table top, manual control that can be positioned anywhere on a work surface and has a dial to adjust speed. 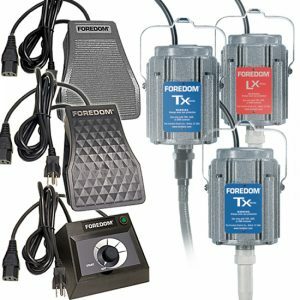 Controls for Series TX and LX motors are NOT INTERCHANGEABLE with controls for Series SR and other discontinued universal type motors. 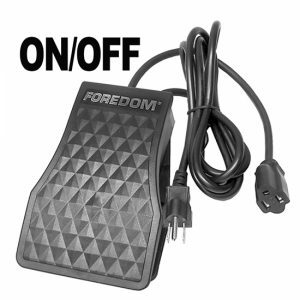 Foredom speed controls come in 115 volt for use here in the USA and 230 volt for use overseas. 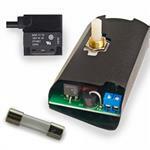 Different plug options are available for CE rated and other 230 volt models. 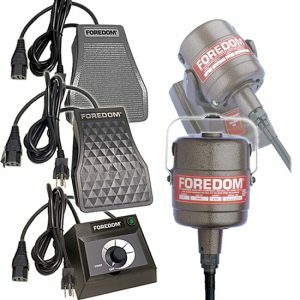 Finally, Foredom offers On/Off Foot Switches for use with flexible shaft and other stationary power tools. These ‘Momentary On’ switches allow users to turn a tool on and off without having to use the manual switch.